Making sense of a horse coming in off a six-month layoff often proves difficult. Twelve months, even moreso. In Saturday’s fifth race at Arlington, Montana Kid (Empire Maker – Keeping the Gold, by Langfuhr) hit the track for the first time in thirty-five months. He had raced seven times before, with four wins. All seven of those races had come in 2012. 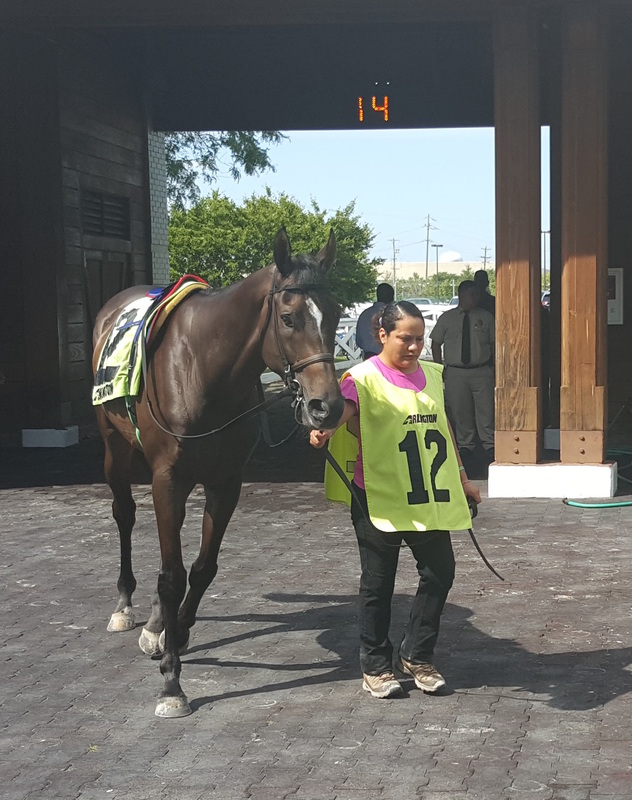 He debuted at Hawthorne, going two turns on the grass against Illinois-bred company. Montana Kid finished well ahead of favoured stablemate Iolanda’s Perfect, but five lengths behind a 6/1 shot who turned out to be pretty good: The Pizza Man. Montana Kid resurfaced at Arlington the next month, again facing Illinois-bred maiden special weight company. He obliged as the odds-on favourite, pressing and dispatching with a game Piratesinparadise. He cleared state-bred N1X on his first try, and then state-bred N2X next out. Open N1X proved a bit harder. In his first try, he finished a well-beaten seventh behind familiar foe The Pizza Man. Next out he finished a troubled fifth, but only a length and a quarter out of second. Third time at the condition was the charm. Let off at 8/1, Montana Kid finished wide and finished best. His stablemate, sent off the 8/5 chalk that day, is another familiar face in stakes races three years hence: Yankee Dealer. Then, Montana Kid disappeared for almost three years. He returned to the worktab in May, and built up a solid series of works leading up to being entered for Saturday. It was the sort of worktab a handicapper would want to see from a layoff horse, especially one going two turns. He started going three furlongs, then four and five. All but one of his last five works were in the top half for the day in terms of relative speed. Still, questions lurked beyond the works. It had been nearly three years. Montana Kid also took a significant drop in class from the types he had faced in the summer of 2012. He had never previously been up for a tag. Saturday, anyone willing to put up the riskiest eight thousand dollar investment in horse racing had a chance to bring him home. All I had to go on entering the race on Saturday1 was his series of works, as well as what I could see in the paddock. Paddock observation is an integral part of how I solidify my opinions at the races, but I gave Montana Kid particularly deep scrutiny. How did he look? How was he walking? What looked awry? Was what kept him away from the track for three years visible? Though Montana Kid did not appear the proverbial “man amongst boys” in the paddock, he did not look outmatched either. Nothing looked obviously off in his looks or his walk. He looked as fit as anyone in that race. For a horse to come in off of a three-year lay and blend right in with horses who had raced that month, something had to be going right. Montana Kid was marooned on the outside of a twelve-horse field going a mile on the grass. He had enough space to tuck in a few paths, but still sat four-wide by the time the field hit the clubhouse turn. Down the backstretch, a trio of other runners got loose: 20/1 shot Nobiz Like Shobiz led, Artful Bee pressed, and Exchanging Kisses tracked close by. Montana Kid remained midpack. As the field closed ranks, nearing the far turn, Montana Kid moved well. Though they were still wide, Jerome Lermyte had Montana Kid moving strongly into the stretch: dead aim on the leaders, open space in front. Pacesetter Nobiz Like Shobiz stayed on the best of the trailblazers. Montana Kid gained on that longshot with every step. Favoured Shoot the Loop started making up ground as well, even farther outside, but Montana Kid had the jump. He crossed the wire a nose in front of his rival on the outside, with both a length in front of third-place Nobiz like Shobiz. Making it back to the races after a thirty-five-month hiatus is no small feat. Shoot the Loop and Nobiz Like Shobiz may not be as accomplished as The Pizza Man and Yankee Dealer, but getting back into condition and dispatching with eleven other horses first off such a layoff deserves recognition. His future remains unknown, as with any horse, and I hope his new connections2 can keep him sound and treat him with care. Still, Saturday’s victory came as a thrilling surprise to observers — and, I can only imagine, a sort of culmination to Chris Block, the Brommers, and all those who stuck with him for almost three years between races. For making his first race in almost three years a winning one, the spotlight shines on Montana Kid this week. 1 For the curious, some insight into the layoff and what trainer Chris Block had in mind coming into this race was published the day after the race, in Sunday’s Arlington Barn Notes. Thanks to Michael Adolphson for covering Montana Kid in the Barn Notes; I found them a fascinating read. 2 After Saturday’s race, trainer Larry Rivelli and owner Patricia’s Hope LLC (Vince Foglia) claimed Montana Kid in a two-way shake. thank you for everything, Palace Malice.